Pascal at a great price. Remember that scene in National Lampoon's Christmas Vacation when Clark Griswold receives a yearlong Jelly of the Month Club membership instead of the Christmas bonus he was expecting? That is the sort of thing that can happen when you leave gift giving up to others. If you want to take matters into your hands and treat yourself to something nice, Newegg has a pretty good deal going on for a Gigabyte laptop. 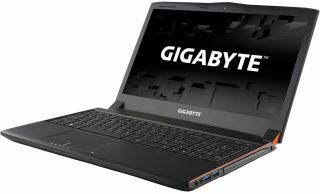 It's the 15.6-inch Gigabyte P55Wv6-PC3D featuring a Full HD 1080p (1920x1080) IPS display powered by an Intel Core i7-6700HQ processor, 16GB of DDR4-2133 RAM, and a GeForce GTX 1060 GPU with 6GB of GDDR5 memory for $1,099. On the storage front, this laptop pairs a 256GB SSD with a 1TB HDD. It also has a DVD burner shoved into a chassis measuring 14.92 x 10.59 x 1.08-1.14 inches and weighing 5.73 pounds. Connectivity consists of 802.11ac Wi-Fi, Bluetooth 4.1, three USB 3.0 ports (Type-A), a single USB 3.1 Type-C port, VGA and HDMI outputs, and separate microphone and headphone jacks. Other features and amenities include an SD card reader, two 2W speakers, full-size backlit keyboard, HD webcam, and a 6-cell battery. Finally, the laptop comes with a mousepad and free gift from Nvidia, that being your choice of one of three games: Maize (indie), Redout (indie), or Raw Data (VR). This deal may not last long as Newegg sold out of the same laptop in a 17.3-inch chassis for $1,199.